Did you know that you can access many of software packages offered in the General Access Labs remotely from your own computer? With a VPN connection to the UWW network, you can even access the software off-campus! All that’s required is access to a Windows or Mac computer, and a high-speed internet connection. If you want to access the secure network while off campus, you can use Cisco AnyConnect. AnyConnect is a Virtual Private Network or VPN that allows you to remotely access the campus’s network. Since the campus’ network infrastructure is protected from internet viruses and worm attacks by a firewall, VPN solution is necessary to gain access to specific campus resources, such as network storage, while maintaining the security of the system for both users and the network. UW-Whitewater enables VPN access using the Cisco AnyConnect VPN Software. VPN securely encrypts data transmissions from your computer to the campus network. A valid campus net-id and password are required to gain access. If you use a University owned laptop, AnyConnect should already be installed. Login with your UW-Whitewater Net-ID and password. Select the ‘AnyConnect’ item from the menu on the left. Click the link to ‘Start AnyConnect’. If you have not been through this process, or you do not have the correct version of the Java Runtime Environment installed, a pop-up window will appear and direct you to download Java Runtime Environment. 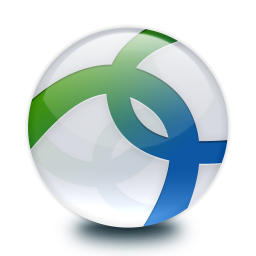 When prompted, install the AnyConnect software. When the install is complete, the webpage will refresh to show that you are successfully connected. Accessing most campus enterprise technology services, such as Email, calendar, the UW-Whitewater web site, WINS, and other web-based services does not require the use of the VPN. If you have questions or issues setting up the VPN, please contact the UW-W Helpdesk. Access your University Email on Mobile through ActiveSync! Students can access their University email from Mobile Devices (Apple/Android) through ActiveSync! 1. From the main screen of your Apple iOS device, locate and tap the “Settings” button. 2. Locate and tap the “Mail, Contacts, Calendars” option. 3. Tap “Add Account” to configure a new mail account. Description: A description of your email account. Click “Next” to continue forward. 6. Select which services you would like to sync with your phone, then click “Save” to finish. 1. From your Android Device, locate and tap the “Settings” button. 2. Locate and tap the “Add Accounts” button located under the “Accounts” option. 3. Select “Email” from available options. 4. Enter your UWW Email Address and Password (If you would like to send emails from this account, check the checkboxoption). Then click “Next” to continue. 5. 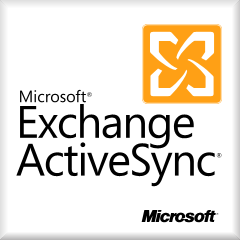 Select “Exchange” or “Microsoft Exchange” when asked to select an account type. 7. Select your email sync options, then click “Next” to continue. 8. Enter an Account Name. Click the “Done” button to continue. Enjoy browsing your University Email easier on the go! In the event that you lose your mobile device, you can remotely block or delete the information from Outlook Web Access. For assistance in performing this operation, please contact the TSC Helpdesk at 262-472-HELP(4357) or via email at helpdesk@uww.edu. Have you ever found it difficult lining up, and visualizing your schedule while enrolling for classes? Well the Schedule Planner is the tool for you! Navigate to “Main Menu” — “Enrollment” — “Add a Class” — “Add Classes” and select your term. Once your on the Schedule Planner click the “Add Course” to start adding classes to your schedule. When you’ve chosen all of your classes, go back to the previous page and scroll down to the “Schedules” section and click on “Generate Schedules”. 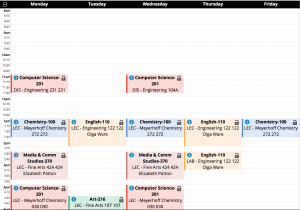 Now you can see all of your possible schedules with whichever classes you have selected. You can also add breaks, or times of the day you don’t want a class. If it turns out there are any conflicts in your schedule, Schedule Planner will let you know. You may know that you have access to Lynda for free as a student here at UW-Whitewater, but did you know that they offer courses on topics beyond technology? Lynda can teach you a whole lot more than you might have originally thought! Take advantage of this amazing resource by checking out Lynda.com! We have a few tips and tricks for you to keep in mind the next time you take a quiz in D2L. The items below will help you avoid the most commonly reported issues with quizzes. If you close out your browser while taking your quiz the timer will not stop. Please ensure that you have enough time to complete the quiz when you start it. If something happens and you are not able to complete the quiz, please contact your instructor. Know when the quiz ends and how much time you have to take the quiz so that you can plan accordingly. Be aware of how many attempts you have to take a quiz. Many professors allow for more than one attempt at any given quiz. Don’t run out of attempts before you get your desired grade. Before you submit your quiz, click on the “Save all Responses” to make sure that all of your answers have been saved. Submitting a blank answer won’t be good for your grade. If you run into any errors with your quizzes, or other D2L tools, please contact D2L support. Now that the Fall semester is well underway, we wanted to share some common issues and resolutions with you to help you avoid headaches while working on your coursework in Desire2Learn (D2L)! Dropbox. If you are having trouble submitting a file, first check to make sure you are not using any special characters or quotes in the file name. If that doesn’t work, try using a different browser on your computer. Discussions. Unable to view any posts in the discussion forum? Some courses require you to first create a post before you can read any of the other entries in the discussion forum. You’ll see the words “Must post first” directly under the discussion forum name if this is enabled in your course. Other Issues? 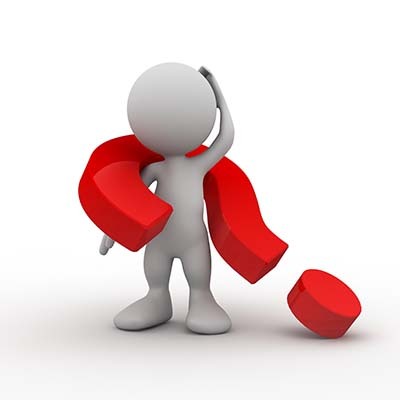 We have a full FAQ, Tutorial Videos and a User Guide all at your disposal 24×7. If you are having issues, or running into problems, help is only a click away! Contact us at anytime with your questions or issues by filling out the UW-W Desire2Learn Support Form. The semester is coming to an end and Summer is right around the corner! Before I leave you all I want to talk about Grades in D2L. It’s important to check your grades before the semester is over to make sure everything looks correct before professors submit your final grades. Once professors submit your grades they are final, and they cannot be adjusted. 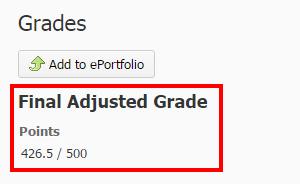 Professors who post final grades to D2L can be found at the top of the Grades page in D2L, as shown below. Not all professors will use to D2L to post final grades. If you do not see your final grades in D2L they will be posted in WINS. Also, be aware of a visual change in D2L. This will include icons and font. Nothing too major! I hope you all have an easy finals week as well as an amazing Summer! The end of the semester is coming to an end and many of us are scrambling to collect all the work that we have done over the course of the semester! If you are graduating or leaving the University, and have an ePortfolio, then it’s important to know about myDesire2Learn. 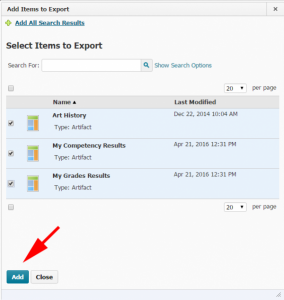 myDesire2Learn is a cloud-hosted ePortfolio that lets you import all your information from your ePortfolio in D2L. 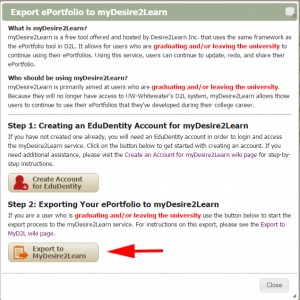 To access myDesire2Learn log into D2L and click on the Export myDesire2Learn button on the right side of your D2L homepage. Next, a screen will appear that gives instructions on how Export your ePortfolio. You will first need to create a EduDentity account. 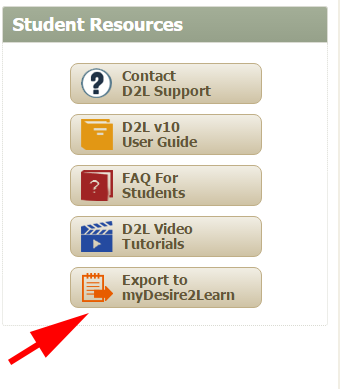 When you have created your account and have returned to the D2L homepage, click on the Export to MyDesire2Learn button. On the next page, click on the Add Items box. You can then select all the items you would like to export. After you have selected all the items you want, click Add. Login to your EduDentity account on the pop-up screen. After you login the following screen will appear letting you know the status of your ePortfolio. After your ePortfolio has a status of complete you can login to your EduDentity account at https://www.mydesire2learn.com/d2l/login and your ePortfolio will be waiting for you, and you never have to worry about it going away! If you have any questions regarding your ePortfolio please contact UW-W Desire2Learn Support. Did you know you have an ePortfolio? The end of the semester is coming to an end and many of us are scrambling to collect all the work that we have done over the course of the semester! The D2L ePortfolio is a tool which allows you to collect a number of artifacts and resources into one spot where you can easily view and manage them all. 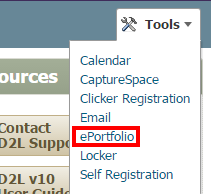 To access your ePortfolio, go to the right hand side of your D2L homepage and clicks on Tools and then select ePortfolio. From there, you’ll be brought to your ePortfolio home page. On your home page, you have a number of different resources, including a feed which shows you the resources that you’ve updated, worked on, or have been shared with you from other people. You can also Add files and Add links from this page. Under My Items, you see a list of the objects you’ve created within your ePortfolio. To view them, simply click on the desired artifact, or you can click on the drop down arrow at the end of their name where you can view them, edit them, copy them, share them, delete them, and add them to presentations or collections. Under the Explore tab, we can see the artifacts that have been shared with us from other people. Lastly, under the Sharing Groups tab, you can create a sharing group which allows you to easily share things with multiple people without having to individually add each one. This allows sharing to be much more easy, quick and convenient .